5.3m, 438 feet elevation gain. I had somehow fallen into running this race. Michael couldn’t run, he suggested I have his number, a few texts and emails later and it seemed I was in the running. I had a few reservations. It was THE strider race of the year…the pressure would be on. It wasn’t in my plan, there were events on the horizon that I wanted to concentrate on. My last few races had been reasonable but had left me disappointed. My race head was at an all time low. I was recovering from an injury and didn’t want to aggravate it again. Oh, the list, how it goes on! Anyway, I arrived at registration slightly later than planned…it didn’t matter, I had resolved to use it as a good training run, nothing more. If I started after the gun, all the better. Hopeful faces greeted me and I dismissed their optimism with, I’m not racing, I cant be bothered! At the start I met a very bouncy excitable Rachelle, she attempted to lift my glum mood…and failed. We all assembled on the lush grass before the start line, after a race briefing and a minute silence to remember Alan Purvis, we were off across the race track which was laid out in front of us. I was running at an easy pace, I watched gleefully as the fast group fought to gain good ground and disappeared into the woods. Now I could relax, I was just going to enjoy this. However, it wasn’t long before I got stuck behind a woman who decided to walk and then block my path through the woods, feeling frustrated, I picked up pace and started picking off people. This was fun, the pressure had all gone…disappeared into the distance. As I speeded up, I started to target runners to catch up, it became a bit of a game. I’m not entirely sure when the game became a race, probably when I caught sight of those that I’d thought had long gone. Susan’s encouragement of “at the moment, your 4th” really got me, it’s what I needed. The little shove to move up the ranks. 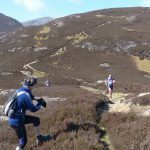 As one of Geoff’s guinea pigs during his Fell Coaching Training, I knew every hill possible on this course, and had suffered on EVERY hill, whether that be running hard up or down. 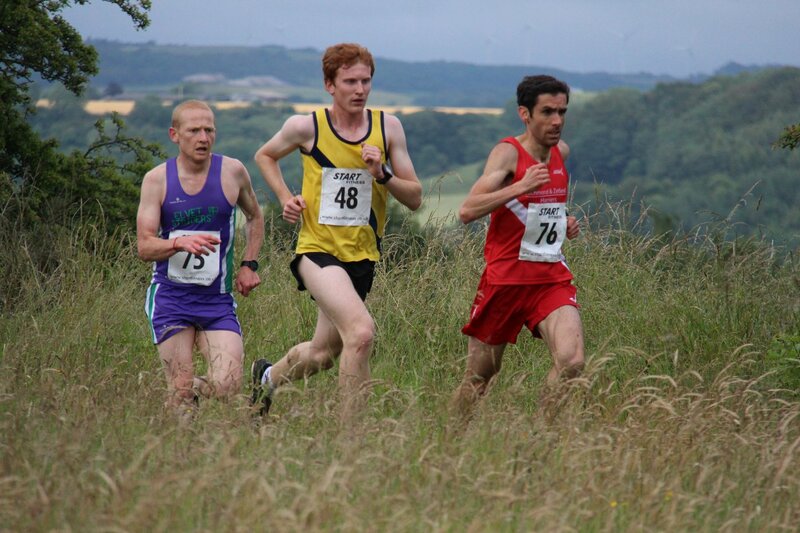 This race then felt familiar and even the big hill up to the willow miner…was now doable. By then Penny was in my sights, then 2nd lady. I clung on to her, waiting for my move. I thought it would come on one of the hills in the woods, unfortunately it was much later. 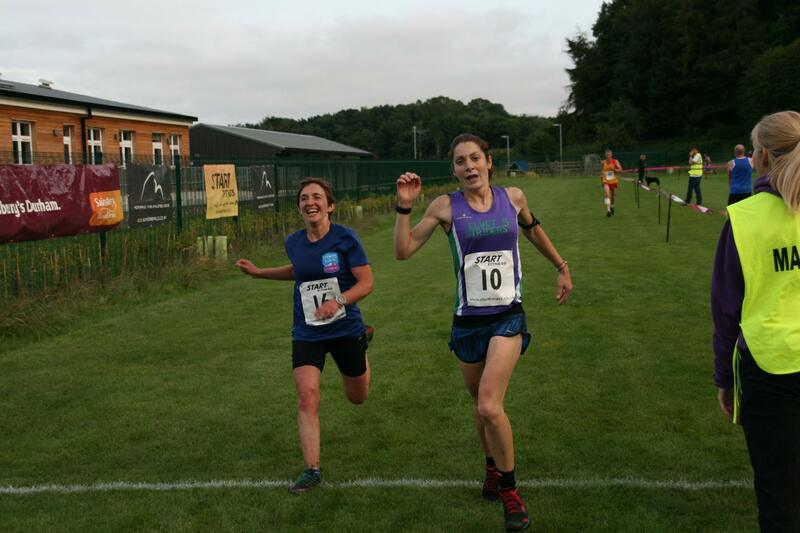 We ended up hurtling onto the grass track to the finish neck and neck. Every time I tried to increase speed, she would match it. Many thoughts whizzed through my mind, the overriding was how much I wanted to reach that finish line before her. With time running out and the line fast approaching, I gave one more push and finally pulled in front, one stride ahead and there it was, the white line. It was exhilarating and totally unexpected. Second lady, first strider lady for the third year. So about the race…Its a beautiful route, showcasing 5.3miles of our amazing training ground. It is tough, with many undulations, fast downhill sections and long drags back up. It is extremely well marked (even tree routes are highlighted green), marshalled and supported by our wonderful club. For £11 you can ‘enjoy’ this brute, quench your thirst on water and coffee sachets at the end. 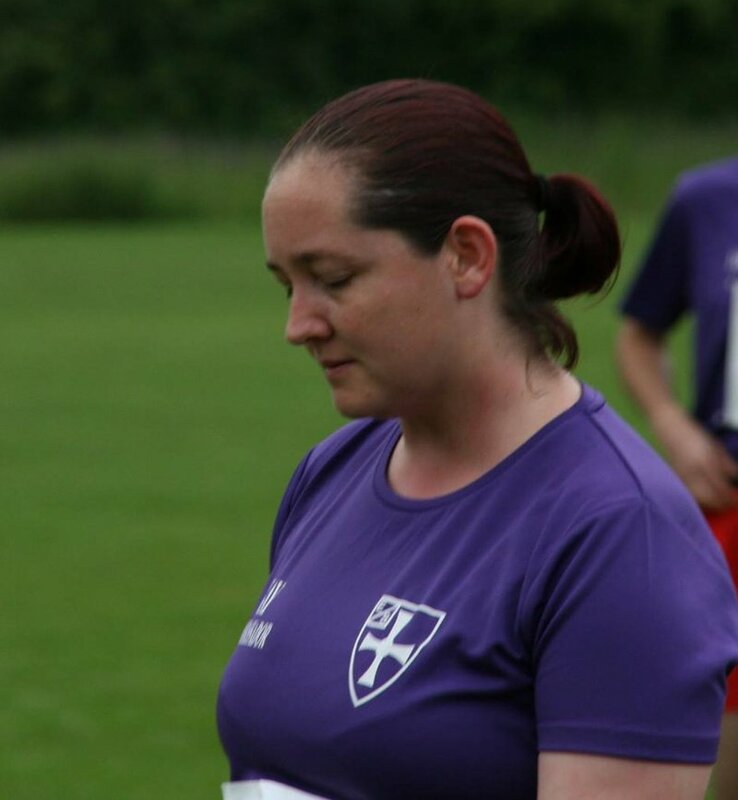 Then drink some more, fill your belly and share trauma stories with fellow club mates at The Court Inn. What better way to celebrate Elvet Striders? I had toyed with the idea of entering the Clamber for the last couple of years, always deciding against it at the last minute. 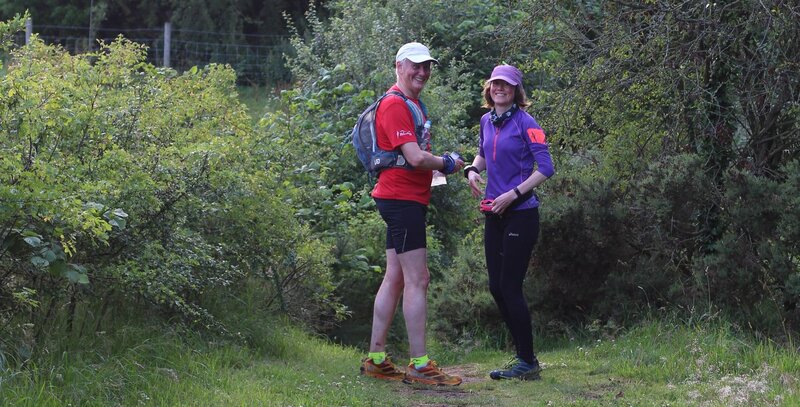 I was tempted again this year with the re-vamped Willow Miner Trail Race, I’d heard it was a toughie and got the impression it was only for ‘serious runners’ but when I looked into it I was assured there were no cut off times and everyone was welcome to take part… I decided it was probably for the best if I gave it a miss, it was the night before my son’s Birthday and I’m usually pretty busy blowing up balloons and wrapping presents! 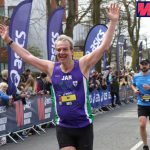 Then about 2 weeks before the race a notification popped up on the Striders Facebook page – Mike Parker couldn’t do the race due to injury – and against my better judgement I said I’d take it… I had already agreed to buy the T-shirt after all! Leading up to the big night I had been hit with a head cold and my training was abandoned, I managed a couple of miles here and there but I felt utterly defeated. I was only 2 weeks in to my GNR training and I had already hit a brick wall! I was starting to feel a little better the week of the WMTR, I went out for 3 miles on Monday and I wasn’t too bad. I knew I was going to take part on the night but I wasn’t feeling fit, the night before I had a nightmare about the race (I can’t remember specifics but I think I forgot my watch, my number, went to the wrong race… you get the gist) and I was nervous all day thinking about it. When the race started I stayed at the back, I knew I would be the unofficial tail-runner and I’d come to terms with that fact. Before we’d even left the field I saw another woman turn back, telling her friends she was ok but she wouldn’t be running. Just 1 mile in I could see I was falling back even further than I had expected, but I kept going… up the steep steps at Houghall Woods then I was keeping a steady pace on the flat but I couldn’t see a soul in front. Almost 2 miles in, I was already fighting my own demons and trying to keep my breathing in check (after still being in recovery mode from my head cold) then out of nowhere a guy walking in the opposite direction said to me “you want to go faster than that, you’re last” – and just like that I felt everything. The pain, the fear, the doubt, the anger, the defeat …I couldn’t breathe, I was fighting back tears. I tried to tell myself it didn’t matter, of course I was last, who cares! I was never in it for the win – if I was I wouldn’t bother getting out of bed! I’m not built for winning, for speed! 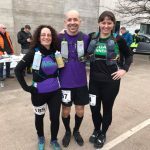 Then I could see the next marshal point, Kate and Katharine, so friendly and encouraging – just as much for me as they were for the 1st runners along the route – and I broke down and hugged Katharine, not sure if I could even carry on. I’m not sure how long I was there, I don’t think I fully explained myself at the time but it was clear I might not continue. Then I thought about my club, and the T-shirt I was wearing, it had been modified to not only show the club logo but also to promote my role as Mental Health Ambassador and #runandtalk was emblazoned on the back. This role means a lot to me. 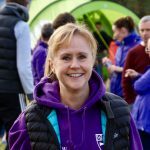 It isn’t just about letting people know it’s ok to talk and that running can improve your mental wellbeing – it’s about setting goals for yourself that push you out of your comfort zone, it’s about running and talking (to yourself sometimes) and being that positive voice inside that pushes you further than you ever thought possible. If I was going to continue to be that voice for others then I had to step up and be that voice for myself. I was going to finish this race. All I remember about th e rest of the race is, well, the marshals! Yes there were hills, there was pain, and there was a Willow Miner along the way I believe. 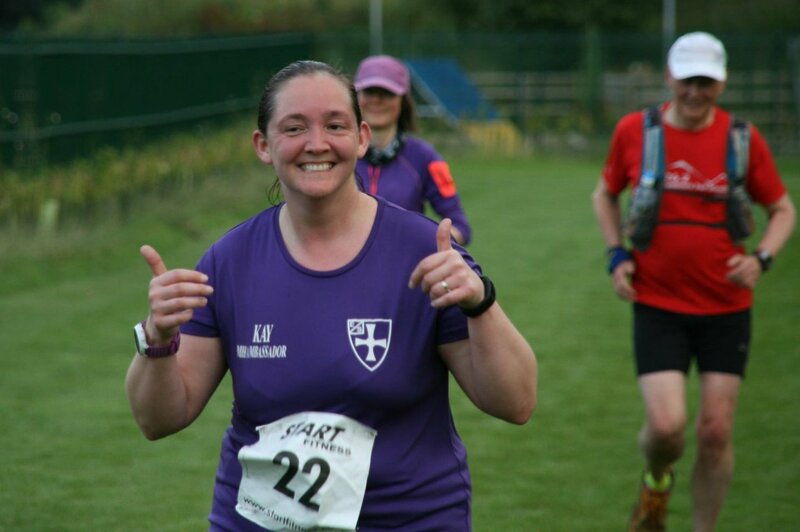 But the marshals were all amazing – smiling, beaming faces, supportive cheers, many bending the truth about how many hills were left, but all so genuinely happy to be there supporting every single runner. Thank you Striders for having me, for supporting me, and for letting me be last. That’s all folks! See you all next year!